We just finished building an awesome screen porch on our lake cottage and I wanted to make something to hang over the door. 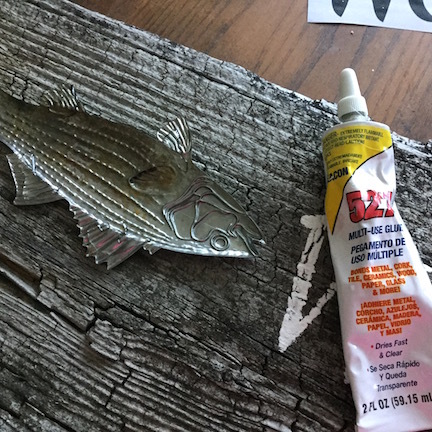 Combining some of my favorite things – old wood from a tobacco barn, and awesome metal dimensional embellishments, this project was the perfect solution! Aged wooden plank – this was wood from an old tobacco barn – but aged pallet wood would also work! 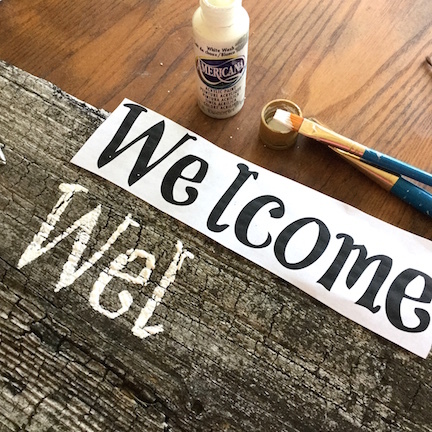 Determine about how big you want your lettering to be on the wooden plank, then select fonts you like. Type up what you want the sign to say and enlarge it enough to fit the pre-determined size. For reference, the “capital W” on my sign is about 2” tall. I chose Coolock Black and HarabaraHand for my lettering. Print the lettering/words. Cut out around the words/lettering. Use ruler to draw a straignt line with a pencil where you want the base of your lettering to be on the sign. Draw another reference line above that line, placed at whatever vertical measurement your first letter is – mine was about 2” so my top line is about 2” from the bottom line. This will help align your lettering as you begin to paint. Use the printed words/lettering to determine placement for the painted text, and as a reference as you begin to hand paint your lettering (Note: you can also use a craft knife to cut out the printed letters and make stencils if you prefer – or use pre-printed stencils – I just wanted different fonts than were available….). 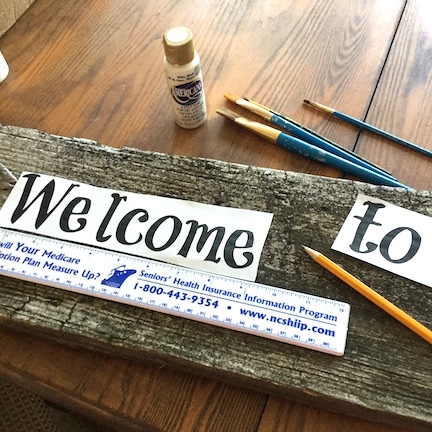 I chose to make the final word, LAKE, much larger than the “Welcome to the” text – so drew additional reference lines before painting that lettering. Paint your lettering with White Wash paint and let dry. My sign is going to be mounted on an outdoor screen porch, so I applied a matte sealant to help protect the painted lettering. Wow, that is an awesome plague! So appropriate for your lake house!